May the best elf win! Twentieth Century Fox Home Entertainment and WWE Studios present outrageous holiday fun when SANTA’S LITTLE HELPER arrives on DVD and Digital HD™ on Tuesday, November 17. The SANTA’S LITTLE HELPER DVD is stocked full of behind-the-scenes featurettes that are sure to bring holiday cheer. 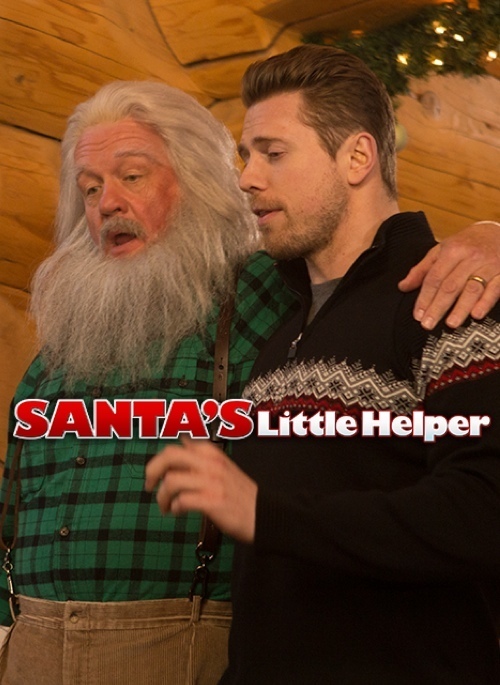 In the Ho Ho Ho, cast and crew members give their own accounts of the job of Santa’s official helper and what goes on behind-the-scenes in his workshop. Other featurettes offer fans a profile on WWE Diva Paige as well as additional interviews with the cast and crew as they discuss what the holidays mean to them and the greatest gifts they ever received. Ho Ho Ho – In SANTA’S LITTLE HELPER the “Ho Ho Ho” is Santa’s right hand man. But what exactly does this job entail? Cast and crew talk about the “Ho Ho Ho’s” duties and what really goes on behind-the-scenes of Santa’s workshop when the deadline for the big day is looming. Introducing Paige – WWE Diva Paige has had quite a year. She debuted on Monday Night Raw® just over a year ago and in that time has been WWE Divas Champion twice, become a star on the E! hit series Total Divas®, and will now be acting in her first ever movie! Through interviews with the cast, the director and of course Paige herself, fans get an in-depth look at how she prepared for, and successfully executed, her role as Eleanor. Holiday Cast & Crew – A fun behind-the-scenes look at the cast and crew, talking about what the holidays mean to them and the greatest gifts they ever received. I LOVE Christmas movies. In this movie about Dax played by Wrestler Mike The Miz is a full of himself guy down on his luck. He just lost his job, girlfriend and car. During a moment of wallowing in self pity Santa appears to him and suddenly Dax is applying for a job that he doesn't know anything. Under the guide of of a beautiful elf/girl Dax is trying to prove himself worthy and working hard to be The Right Guy for the job by having to do some very eembarrassing things like wearing a bear suit to a kid's party and walking into a biker bar wearing a Santa hat. When he finally learns the job is as Santa's assistant he puts his all into getting the job by going head to head with a fiesty elf who also wants the job turning himself into the kind of guy he always could have been. The movie is cute and fun for the whole family. Mike as Dax is likable and the adorable blonde elf is played by AnnaLynne McCord. A movie about letting people in, not taking yourself so seriously, putting others first and changing your attitude for a whole new life. WWE® Studios develops and produces feature films, as well as television and digital content. Its diverse slate is released theatrically, direct to home, and/or across digital platforms, and is co-produced & distributed through partnerships with premiere global entertainment companies. WWE’s film division, led by President Michael Luisi, is headquartered in Santa Monica, CA. WWE® Studios recently launched genre label EREBUS PICTURES with KISS Icon Gene Simmons. Films from WWE® Studios include The Call with Halle Berry and WWE Superstar David Otunga®, Oculus directed by Mike Flanagan starring Karen Gillan and Katee Sackhoff, Vendetta starring Dean Cain and WWE Superstar Big Show and directed by the Soska Sisters, The Marine 4: Moving Target starring WWE Superstar The Miz® and WWE Diva Summer Rae™, The Flintstones and WWE: Stone Age Smack Down which joins Fred, Barney and the whole Bedrock gang with stone age versions of WWE Superstars and Divas, Dead Man Down with Colin Farrell and WWE Superstar Wade Barrett®. Upcoming films from WWE® Studios include Incarnate starring Aaron Eckhart and featuring WWE Superstar Mark Henry®, Killing Hasselhoff starring Ken Jeong and David Hasselhoff, The Resurrection of Gavin Stone starring Brett Dalton, Anjelah Johnson-Reyes and WWE Legend Shawn Michaels, 6:42 starring WWE Superstars Dolph Ziggler and Kane, 12 Rounds 3: Lockdown starring WWE Superstar Dean Ambrose®, and The Condemned 2 starring WWE Superstar Randy Orton® and Eric Roberts. Disclaimer: I received a complimentary product for my honest opinion as part of the Fox Home Insiders Group. No monetary compensation was offered. No, we aren't wrestling fans. No, we're not really fans of wrestling...but my nephews are. My one brother likes to watch that wrestling stuff on TV every now and then. Me I could do without it. My mom is a wrestling fan, big time! I'm not, but my husband is a huge fan. We're not huge fans of wrestling, but this movie looks pretty good and a little different than every other holiday movie! We are fans of wresting & MMA!